Last Saturday, my wife and I visited the Canal Parade, which was the main event of Amsterdam Pride 2018. Sunday evening, I went back to Amsterdam for the closing party, because Melanie C. was performing. All in all, it was a very sunny and happy pride! Below, you will find a description of the festivities as well as two vlogs. Last year, about 100.000 visitors saw the eighty boats of the canal parade. That is exactly what made Amsterdam Pride 2018 so unique. I have visited San Francisco Pride and I have seen many videos of pride celebrations all over the world but I have never seen a pride like the one in Amsterdam. Having so many canals, it only makes sense to have the parade take place on Amsterdam’s water. Each year, a lottery decides which boats are allowed to join. Many, many organizations apply and only eighty are allowed to join the parade. These eighty boats start their tour, which is a couple of kilometers long, at 12:30 pm and the final boats come in at around 5 pm. You can conclude that eighty is more than enough and if I am honest, I have never seen all eighty of them. Each year, pride has a main theme and every boat comes up with a theme to support the main theme. This year, the theme was HEROES. My wife and I went with a friend and we arrived in Amsterdam a bit late, around 3 pm. It was all good, though, because some people we know gave us their spot, which was right at one of the canals. It was the perfect spot and we had a perfect view of the canal parade. Every year, there are some very special boats. This year, for instance, there was a heroic boat with LGBTQIA people from Iran. Unfortunately, because we were there a little later, we missed most of those. Still, we saw some pretty good ones. I always love the boats that have all its people dancing the exact same dance. ING was pretty good at the synchronized dancing this year. Other boats that I like are the ones with loud music because there are usually big gaps between the boats and you want the party to continue. Also, the boats with quirky things like a trampoline or towers that go up (and down every.single.bridge) are great. The canal parade is just one big splash of colors and glitter (and activism) on the water. Love it! The best way I can show you, though, is by adding the video that I made. Enjoy and do not forget to subscribe so you can see more queer content! 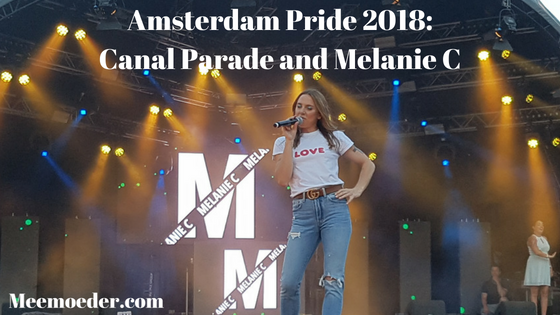 One of my HEROES was performing at the closing party of Amsterdam Pride 2018 on Sunday: Melanie C. So, I went back to Amsterdam for her performance the next day. I have been a Spice Girls fan ever since Wannabe came out and it was the only concert in The Netherlands that my parents did not allow me to go to (too young) and that I did not go to when I was finally old enough to go (because yeah, that is kind of hard when the group has split up). So, hopefully, I will be able to go to Pride Amsterdam again next year. Tell me: were you at Amsterdam Pride 2018? If not, how are your pride festivities and where? PS The Hague Rainbow Festival was really cool as well! It’s very nice of you to mention the Iran Boat in Amsterdam Pride. I’d to share some pictures of the boat with you. I wish we could have wave.